Constantinou Bros Properties offers an extensive list of luxury homes, villas and apartments for sale enabling you to search and browse unique properties in the area of Paphos. We provide our clientele with innovative and comprehensive sales, marketing and management solutions to create the greatest value-per-square-foot and ensure that their property meets their requirements. Homeowners will also be just steps away from the city's best recreation facilities, restaurants and shopping areas. Choosing a home is one of the most important decisions of our lives and it's vital to get it right. Asimina Park and Georgos Complex are two of our main projects located in the main tourist area of Kato Pafos, Cyprus. Designed to appeal to those looking for a high quality home in a prime location. 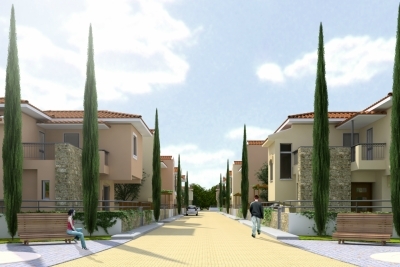 The projects are located adjacent to public parkland, offering peace and tranquillity. Within a short walk you will find the popular tourist area of Kato Pafos, with its blue sandy beaches, water sports, water park, shops, restaurants, and a beautiful harbour with its own medieval fort. Asimina Park features fifty 2 and 3 bedroom villas and townhouses, complete with private swimming pool, garden and private parking area. Where as, Georgos is a complex featuring 2 and 3 bedroom apartments, sharing a communal pool and secure parking area. Set on a unique location on a hilltop with magnificent views of the Mediterranean and the town of Pafos in Cyprus. Konia project is the most impressive development by Constantinou Bros Properties in the picturesque village of Konia. All properties are designed to the highest specifications for the ultimate in living accommodation.Whether you are looking for a holiday or a permanent home, if what you are looking for is a quality home, look no further, we have the ideal place for you.The projects feature villas, bungalows and custom build luxury houses. Furthermore, the development is close to a wide variety of facilities and amenities, only a couple of minutes driving from the main tourist area of Kato Paphos and the beach.